This is a large group which makes the logistics a bit tricky but our guide Nikolina managed to pull it off. She provided interesting and quirky commentary throughout the long ride to Plitvice from Split. The tour is a good if rather costly way to visit the lakes while transferring from Split to Zagreb or vice versa. The transfer was the perfect thing for us and the tour a bonus. The driver and guide were great, the tour was okay. I've heard a lot of people say how beautiful the lakes are and they were....the waterfalls gorgeous and the lakes so clear you just want to jump in. The narrow path and quantity of tourists were the problem, my wife and I both felt we spent more time looking down and dodging other people that it wasn't a very enjoyable walk through the park. Plus we're both from PA so the beauty of the outdoors is something we're accustomed to seeing. Glad we didn't skip the tour but don't see a reason to go back. The tour was great and our tour guide had a hard task taking the entire bus (48 people) through the park without any help. She did great keeping the group together and we had a great time seeing the park. The transfer process to get on the bus to Zagreb was also very easy, and they dropped us off right at our hotel in Zagreb. Since there is not a train that connects Zagreb and Split I can't think of a better way to get between the cities and see an amazing site on the way. Great way to get from Split to Zagreb if you don't want to drive yourself or take other public transport. From Split to lakes we were on a large tour bus. After the lakes and lunch those of us going to Zagreb got our things off the bus and switched over to a small van. Both were comfortable and clean with very friendly drivers. I was glad I got to see the lakes and would recommend the tour, however, if you are there during peak season it is VERY crowded. It's the perfect option to see the Park and get transferred to Zagreb. The bus stop and bus were very easy to find. Friendly coach driver and tour guide. 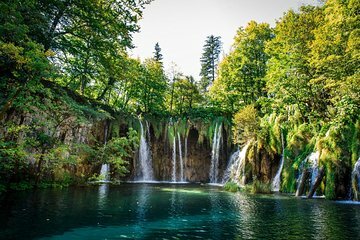 The tour was great, we saw all of the lakes at Plitvice Lakes. We had a late lunch at a local restaurant which was great value for money 3 course meal. The company does daily tours from Split - Plitvice and Zagreb - Plitvice, with both groups meeting at the same restaurant for lunch. So it was very easy to hop on the other bus and transfer to Zagreb. The bus drivers dealt with my luggage and upon my arrival to Zagreb, I was dropped as close to my accommodation as vehicles could access. Mario and Tiho were excellent guides. They made sure to get to know everyone on the bus and were really funny and kind. I appreciate the extra effort they made to be friendly hosts as I'm sure the job can get repetitive. I'd recommend anyone travelling to the lakes check out the weather beforehand. Coming from hot Split to the mountains can mean a big difference in temperature--dress accordingly!